Everybody believes the miso you made is the best! Examine your soy beans and remove any that are darkened or insect damaged. Use a generous amount of water to give the beans a quick wash. Now soak the beans in water for 18-24 hours. The volume of water should be at least 3 times the volume of beans. 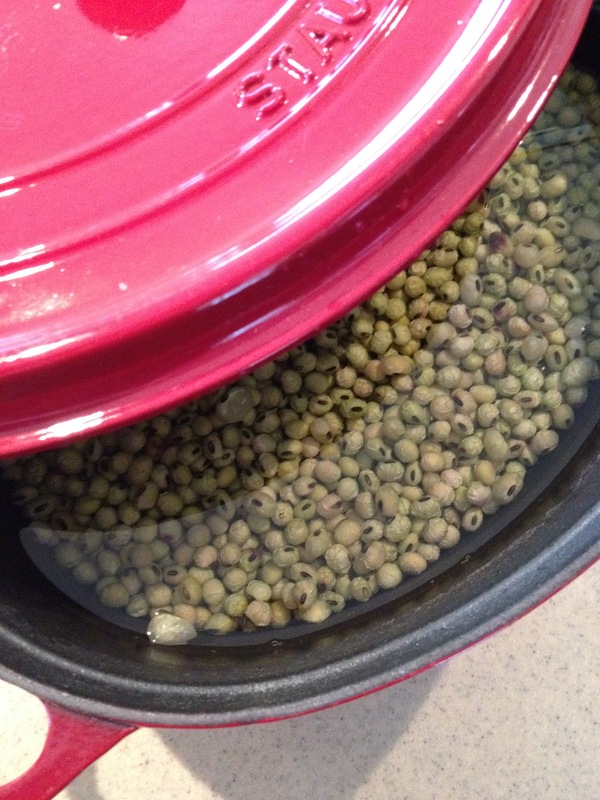 ① Drain the beans and transfer them to a large pot. Fill the pot with water and start heating the pot to bring it up to a boil. You will need to boil the beans for about 4 hours. Periodically stir the beans to avoid burning and ensure the beans are cooked evenly. Skim the foam from the surface of the water as the beans cook. Add water as needed to keep the beans completely covered with water. If you use a pressure cooker the cooking time (starting at the point the cooker starts to vent steam) should be about 20 minutes. 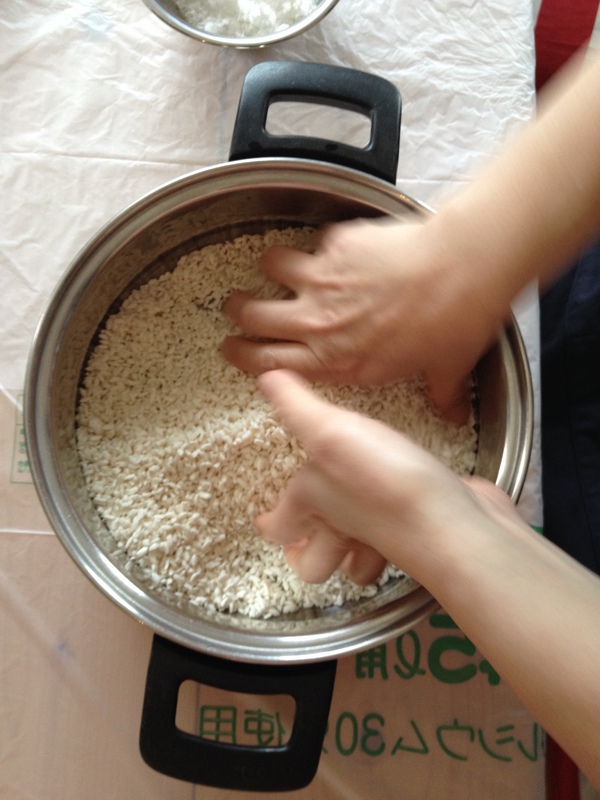 ② Cook the beans until they are soft enough that you can easily smash them with your fingers. 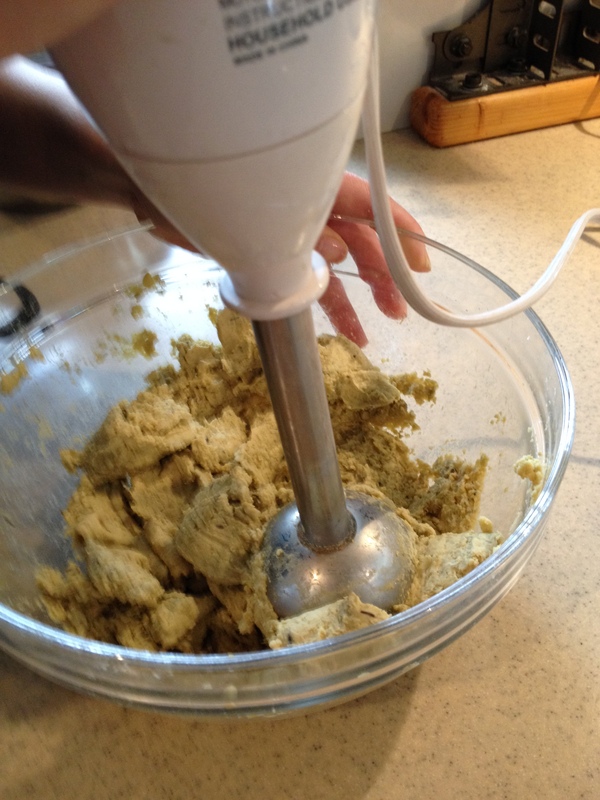 When you smash a bean, you want it to break down into a paste-like texture; not chunks. Once the beans are soft enough, turn off the heat and drain off the water. ③ While the beans are cooking, pour the kome kōji and salt into a large mixing bowl and mix well to make sure the two are evenly incorporated into each other. Once the beans are done cooking and you have drained off the water, immediately start to mash them into a smooth paste. You can do this with a food processor; with a mortar and pestle; by placing the beans into a stout plastic bag and rolling a jar back and forth over them… Do what works best for you. The beans are most easily mashed while they are warm. ④ Once the beans are mashed into a smooth texture, gradually add the mixture of kōji and salt, and mix it into the bean paste. The key here is to get the kōji and salt evenly distributed throughout the bean paste. This is important for preventing the development of mold. 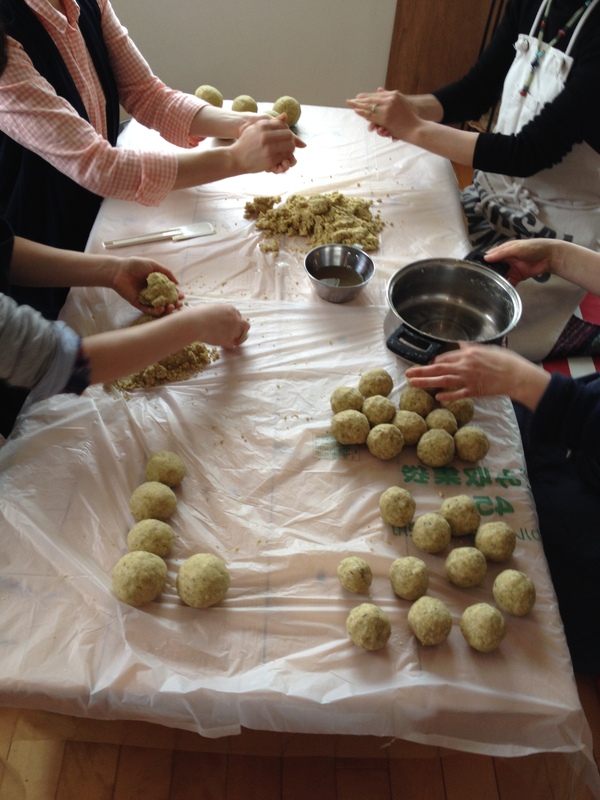 ⑤ Use your hands to form the soy-bean-kōji-and-salt paste into balls each about the size of a tennis ball. Put some strength into your hands as you do this, so you can make balls that are dense and do not have any air pockets. 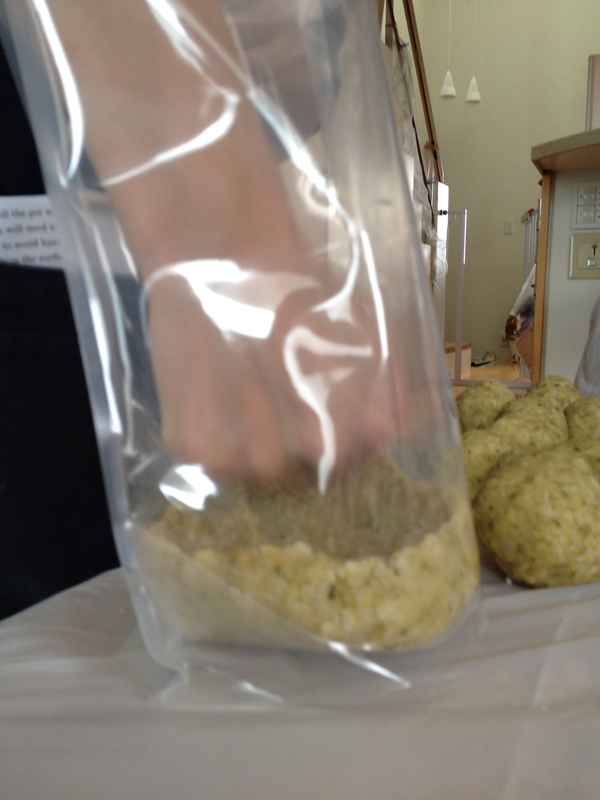 ⑥ Once you have formed all of the paste into balls, begin stuffing the balls into the Lamizip pouch. Press the balls in (Yes, this will cause the balls the break down) tightly to make sure there are no air pockets in the pouch. When you get all of the paste into the pouch, level off the surface of the paste, press all of the air out of the pouch and then seal the pouch. 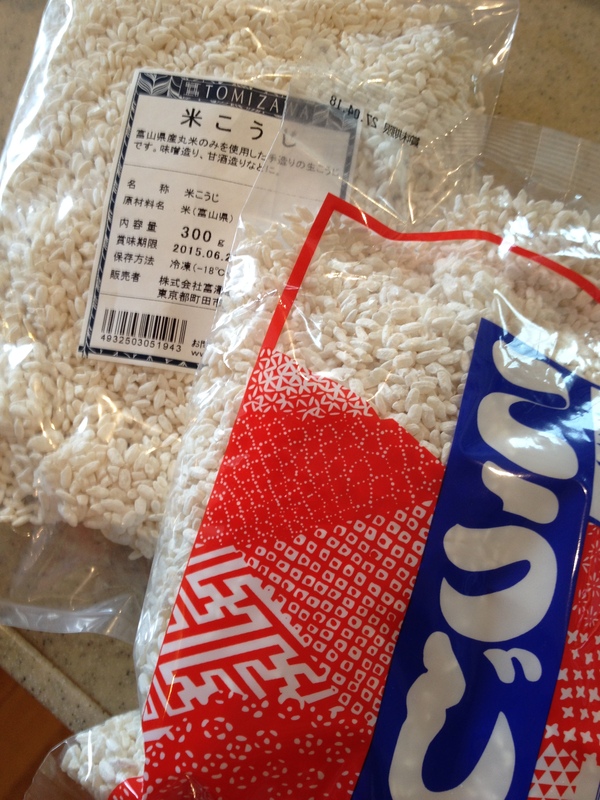 ① Place the miso pouch in a place where it will not get direct sunlight. Change the orientation of the pouch about once a week – lay it on its side, flip it, stand it up, and so on – so that the weight of the miso is shifted. Keep changing the orientation of the pouch until you get a dark liquid like soy sauce emerging on the top of the paste. This is tamari (たまり). As fermentation proceeds, the pouch will swell with gas. As this happens, open the pouch a tiny bit and press the gas out. 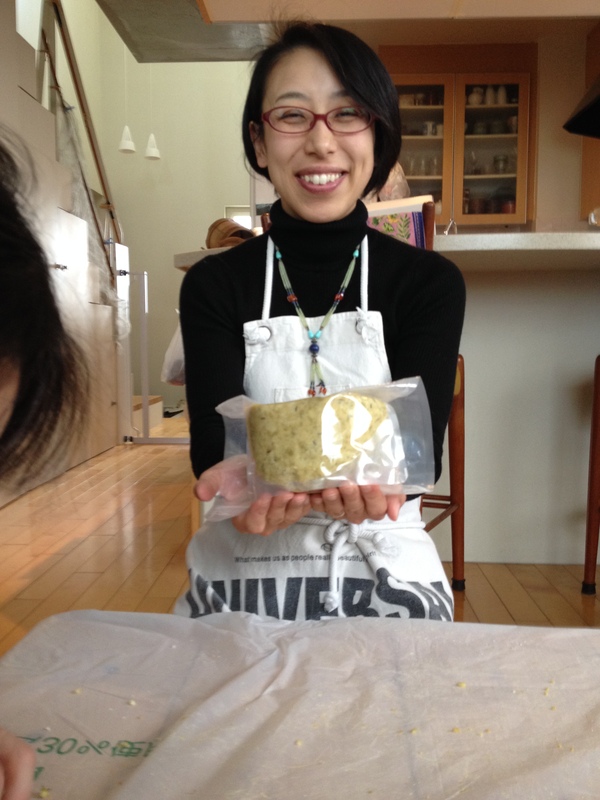 ② Over 3-4 months the paste will darken and begin to produce the aroma of miso. You can begin to use your miso once you notice this aroma. ① You can use a crock or similar container to make miso. If you do, wipe down the inside of the container and the lid with alcohol (shōchū, vodka, gin, etc.) to sterilize. Press the balls of soy-bean-kōji-and-salt paste into the container, again making sure there are no air pockets. Level off the top of the paste when you are done. Sprinkle a layer of salt onto the top of the paste. Make the salt layer a little thicker around the edge of the paste where it meets the container wall. ② Place a sheet of plastic wrap on the surface of the paste, taking care not to leave any air pockets. The wrap should be a piece large enough to run up the sides of the container. Place a weight on top of the wrap. The weight should be equal to about 30% of the weight of the miso. So, for example, if you have 500g of miso, the weight should be about 150g. The amount of weight is important. If it is too great, liquid will be pressed out of the paste and the resulting miso will be too stiff. If the amount of weight is too small, air could find its way to the surface of the paste and lead to the development of mold. As a weight, you could use a plastic bag filled with water, salt, beans, etc. ③ Place the container in a dark, cool place to let it age. ④ After a month has passed, open the container and check for mold. If you find any, simply remove it and reseal the container with wrap and the weight, as described above. Age for a total of about 6 months. At that point the miso should have a light, clean taste. The longer you age the miso the deeper, more complex will become its taste.